I love listening to music. It soothes my nerves. It makes me happy and want to dance. I love talking to my family and friends. I can share with them my worries or my excitement. I always look forward to talking with my parents back home, by phone or via messenger or face time. I’m lucky because my sense of hearing is 100% okay. I know most of us feel that way, too. Our sense of hearing is really important in how we interact with others. Right? Our world will be so quiet when we have hearing impairment or we just hear muffled sounds, perhaps. We will be missing lots of stuff around us that we’re supposed to enjoy. 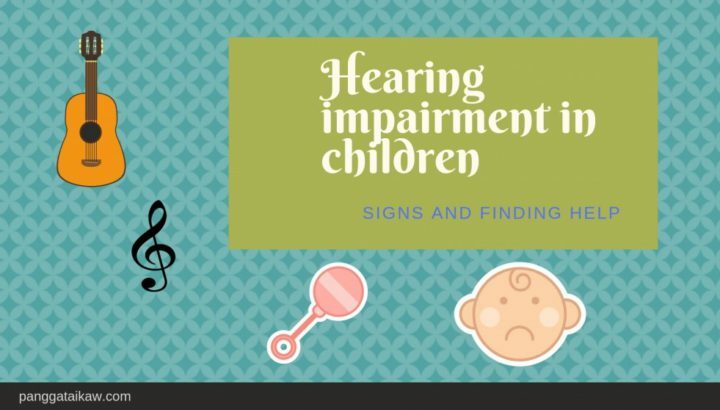 Now, let’s talk about hearing impairment in children, what are the signs and how do we go as parents and caregivers in finding help? CHLOE, a student who is now in high school, started kindergarten in a regular class. The teacher thought she was deaf and mute because she didn’t hear her talking at all. Eventually after 2 years, she was moved to the Special Education ( SPED ) class in her school at age eight. Soon after, the teacher heard her talk for the first time when she was bullied by a classmate. She was stammering and talking in phrases. Teacher Bing started her with one-on-one lessons and eventually, she learned to talk in sentences and read on her own. She was fitted with a hearing aid at this time, as well. After 2 years in SPED, she was mainstreamed to Grade one and she continued to excel in school. Last school year, she graduated with honors in Grade 9. She is a graceful dancer and an artist as well, she has a special talent in drawing. I guess all these talents were enhanced with early intervention of her hearing impairment. Luckily for Chloe, the first teacher recognized right away the need for her to be guided and taught in the Special Education classroom so she was started on one-on-one lessons, thus she was able to catch up sooner. Referral and assessment were also done so she was fitted with hearing aids which really boosted her learning and she was able to cope up well from then on. What are the signs of hearing impairment? Parents need to be very observant of their kids as they grow and develop, so they can be referred and have proper evaluation in a timely manner. Look out for these signs of hearing impairment in your kids. They may look and grow physically like normal kids but have these unusual signs. Poor social interaction. Because he cannot communicate properly, kids don’t like to play with him. No friendships are formed. They may be bullied as well. Teachers might think they are mute because they hardly speak at all when they start school. No response to playing music, somebody talking to them, or to any sound at all. CONGENITAL– born with hearing impairment. This could be genetic, meaning, somebody in the family has it, especially one or both parents. It could be one of the characteristics of a genetic syndrome, like Down syndrome. When the baby is born prematurely or had birth complications like difficult delivery leading to anoxia, or lack of oxygen, they can also have hearing impairment at birth. Ear infection– usually kids with on and off otitis media or infection of the middle ear and not treated right away or not at all. As parents, when you suspect something is wrong with your child or if you observe one or some of the above signs, or he is not developing like kids his age, always ask for help right away. Just follow your instinct and schedule assessments. Timely evaluation and proper intervention really makes a big difference. These kids have the capacity to develop and catch up when helped early on, just like Chloe mentioned above. Assessment is the very first important step. Ask his Pediatrician or your family doctor to refer your child to an audiologist who will assess the severity of hearing loss and who will in turn refer him to an ENT specialist or otolaryngologist for proper evaluation and further surgical management, if needed. A speech language pathologist is an important part of the team as well, who measures the specific speech and language skills of your child and recommends or provides remedial programs as needed. For babies, the newborn hearing screening test is a quick and painless examination and is usually done after the baby is two days old. Fitting of hearing aids, if needed is set up by the audiologist after proper evaluation. 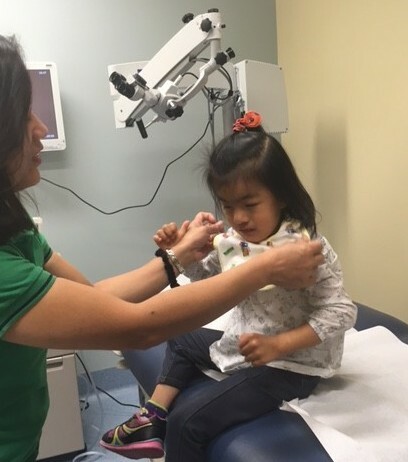 Cochlear implants for eligible kids are done after evaluation of an otolaryngologist. Watch this video about IRELAND, who in 2017, was born with profound hearing loss and had cochlear implants before her first birthday, thus her family is so excited that she will hear them sing ” Happy Birthday ” for the first time. Communication or music therapy augments the hearing aid or the cochlear implants because these do not restore their hearing 100% like normal kids. Special Education could be started on one-on-one lessons, like what Chloe got, as discussed above. Teacher Law of the Romblon East Central School SPED program had 7 hearing impaired students last school year, 4 of them were already mainstreamed in the regular elementary but he still follows them up after school and 3 were still under his care. These kids started with SPED from 6 to 10 years old, they were assessed by audiologists and fitted with hearing aids, except one. When they started school, they were unable to write nor communicate properly. Teacher Law gradually and patiently taught them so they are now literates and able to communicate with the help of sign language. CJ is one of the hearing impaired students who started at SPED at 6 years old, and was mainstreamed to regular elementary after 3 years. With SPED he learned how to talk and communicate with the aid of sign language. He is now in grade 10 and coping well in regular school. He was also a dancer while in the elementary, a skill that he learned because of early intervention. Family support is likewise very important. Interact with your child as much as possible, extra care like cooing more, engaging more and of course, support in all interventions. Expose him to more sounds like music and talking to him at all times. Sign language is another thing that is needed for your hearing impaired child. Let him learn how to communicate with sign language to avoid frustrations. Even with hearing aids or cochlear implants, they are not able to hear clearly like normal kids so, sign language is still very helpful for them. This can be learned in school or with private lessons. 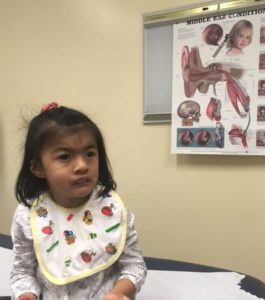 So, again I want to emphasize that observations by parents are really important for our growing special kids so, if you feel that your child has hearing loss, which could be partial or total, schedule him for assessment as soon as possible. When diagnosed really early, interventions are started and these kids can catch up with their language development and even excel in school, like Chloe and CJ and the other kids mentioned above. Ireland, who had cochlear implants just before her first birthday, has already shown great improvement on the way she plays and it will continue on for her to develop her language just like normal kids. As parents and caregivers, let us all be vigilant in the growing and development of our kids. All newborns need to be submitted for the Neonatal hearing screening test and if there is something abnormal, then they will be followed up closely or intervened at the right time. We learned this from the experience of Ireland’s parents. Hearing impaired kids have all the right to hear our conversations, especially the voice of their parents, the soft hustle of the wind, or the music of their favorite singers, so they can dance gracefully with the beat of the music. Let us not wait until they start school and get bullied because they sound weird when talking. After all, our world is happier with music and open communication. Do you have a child with hearing impairment? Is it congenital or acquired? How did you help your child overcome his disability? Please share your journey with us. Post your comments below. Interested in starting blogging and earning later? Wealthy Affiliate University can help you achieve your dreams. Click the image below to see how it can change your life. continue to flourish and help the special kids in our beautiful place. For sure with your support and some generous people, Pangga ta Ikaw will go a long way in helping the special kids in our town. Thanks much for this very enlightening article. We might not notice the importance of this sense of our body, hearing, is to us, as we use this 24/7. This article made us aware about the significance of hearing and its impact to the children in our family, friends or people in our community who are hard of hearing. May this be a wake-up call for us to care for our ears and our role in helping these kids to healthy hearing. Yes, we usually take for granted what we have until we realize that we’re losing it or somebody whom we love doesn’t have it. Like you said, the sense of hearing is really important and we need it 24/7. So, I encourage all parents to be very observant of their kids as they grow and develop because they are able to notice first hand anything not normal for their kids of if they lag in their milestones. I like your introduction in which you emphasized upon using hearing in daily life. And at the same time, people never think of the mercy of having these things. This is really inspiring! I liked what you said especially the idea in which you mentioned that our world is so quiet when we have a hearing impairment. This is very touching! Moreover, I liked the idea that you added information and advertisement of Wealthy Affiliate. I believe as you that WA is the best place to begin a business. We usually take for granted our senses, like hearing until we lose them or somebody in the family suffers with having some deficiencies. And we have to appreciate that we have this important sense of hearing, otherwise, we miss on a lot of joy in our environment. Although, we also need some quiet time in our lives. Yes, Wealthy Affiliate is the place to grow our online business. Glad that we are in the same community. And I have to admit when it comes to kids and their health, it downright terrifies me however, after reading the causes and signs, even remedies for hearing impairment in children. Honestly, it’s really an educative write up. Thanks once again for this! If you are a parent, especially of a special kid, even though you are terrified to watch out certain possible health hazards, you need to really look into these for your own peace of mind and for optimum health of your child. Nothing beats the parent’s first-hand observation. Thanks so much for this informative article. Hearing is definitely important. I saw a video on facebook recently of a baby who got a hearing aid. He was able to hear his mother’s voice for the first time and instantly cried. It made me cry too! It’s so great that we have tools now to help with hearing. And having the use of sign language goes far in allowing people to communicate, grow, and develop. The sense of hearing is really vital for everyone, otherwise we miss a lot of fun and will not be able to communicate properly. Thus, parents need to be vigilant and observant about their kids so they know if they have hearing impairment or not and be assessed early, and given proper intervention if needed. Thanks for this helpful information. I’m glad to see that the child you talked about got the treatment she needed, and hopefully more people will read your post so other kids with hearing impairments can get the treatment they need. I think like you said though, it’s important for the parents to try and recognize it early on so they can help their child as soon as possible. Do you know anyone personally that has a child like this? The parents are the ones caring for their special kids all the time so they need to really be observant of their kids. Early intervention are really important for kids with hearing impairment to minimize speech delay and maximize learning in school. My niece who has special needs has slight hearing impairment and she is just waiting for an assessment of an audiologist. This is great that you are bringing out all these symptoms parents should look for. it even is important for parents to watch for the little subtleties. I was always labeled as trouble in my Catholic school growing up and was made to sit in the front because i was always in trouble in the back. I also has a little ocd going, lol. I did have a lot of exposure to noise, Loud music for one and i think I turned it up cause I couldn’t hear it and that snowballs. I believe as we age, we tend to experience some problems, including hearing loss. Sorry for having that now. Maybe you really had that developing while growing up. Like you said, parents need to be very observant of their kids and I can’t overly emphasize this in my article. Previous Previous post: How to help special needs children- loving them is the key! Next Next post: Is music therapeutic? Know the benefits for your child with special needs.